Tap into 17 Million Terabytes of keyword data. Spot trends in minutes. Get more traffic, faster, by targeting hot trends that are non-competitive. Google has a 70% market share of all searches worldwide, and over 3.5 billion searches every day. 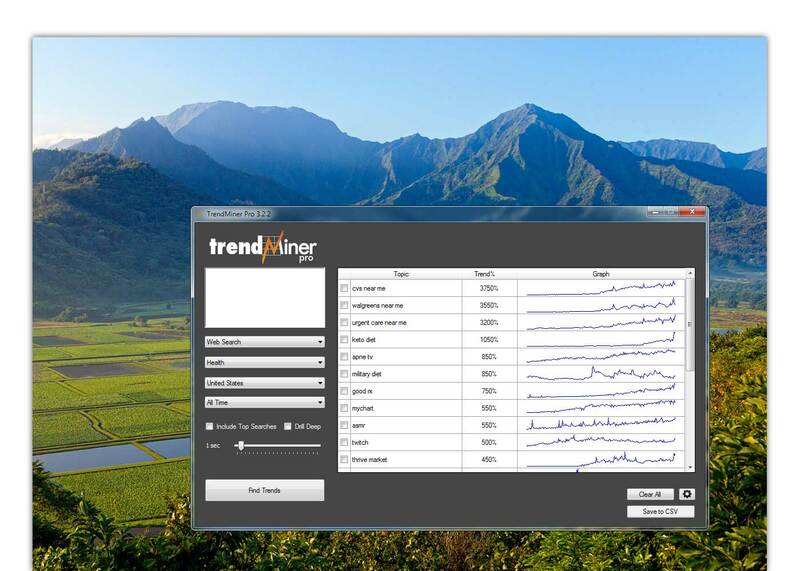 TrendMiner Pro taps directly into Google Trends to help you discover statistically significant hot trends in your target market. Statistically significant data is based on 70% of all searches worldwide. Dig deeper than any other tool. Locate hidden trends quickly. Imagine getting "tipped off" just before a market becomes hyper competitive. You can provide any keyword or even ask Google to tell you trends around a category you're targeting. Choose your search type, category, region, and date range. Decide if you want to include top searches and drill deep. 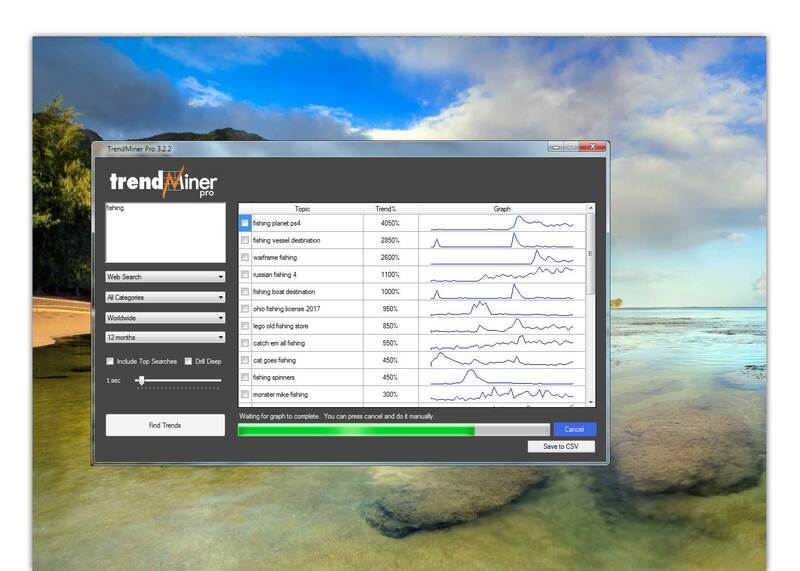 TrendMiner Pro will bring back hundreds of trends. Using the simple graphs, you can quickly see which trends have lots of potential. Windows software installs in less than 60 seconds. Installation video included in the Members' Area. Find an unlimited number of trends from any list of keywords. No limitations for bulk discovery. Find trends from categories, even if you DON'T provide a keyword. The ultimate way monitor your market. Find trends in 303 distinct locations worldwide. Tap into cheap international buyer traffic. Find trends around the top searches in your category or keywords typed in the same session as your search term. Find trends within trends. Drill deep into a market to find hidden trends your competition cannot see. Tunnel through a HTTP proxy to speed up bulk lookups or prevent monitoring of your trend research. Export all your trend data into .csv format to be used in any spreadsheet or notepad program for trend analysis. Find trends for all searches typed into Google. Over 3.5 billion searches per day are analyzed in seconds. HOT! Find search trends for YouTube. Make videos around the highest trending keywords for your topic. Find trends around physical products for Amazon FBA, Shopify, or Google Shopping campaigns. Find image trends. This is an excellent way to find low competition keywords everyone else is overlooking. Find news trends fast and monetize them with press releases and keyword association campaigns. 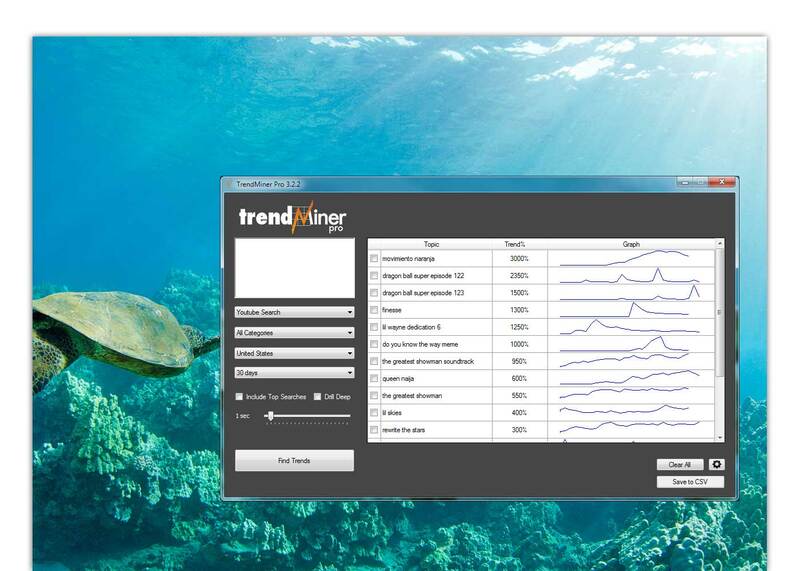 See realtime trend values for the trends you have discovered so you know exactly the trend % for any given time. Sort trends by keyword or trend % and get the best trends in your list. HOT! See exactly which trends are steadily going up and target the most likely long term trends for traffic. 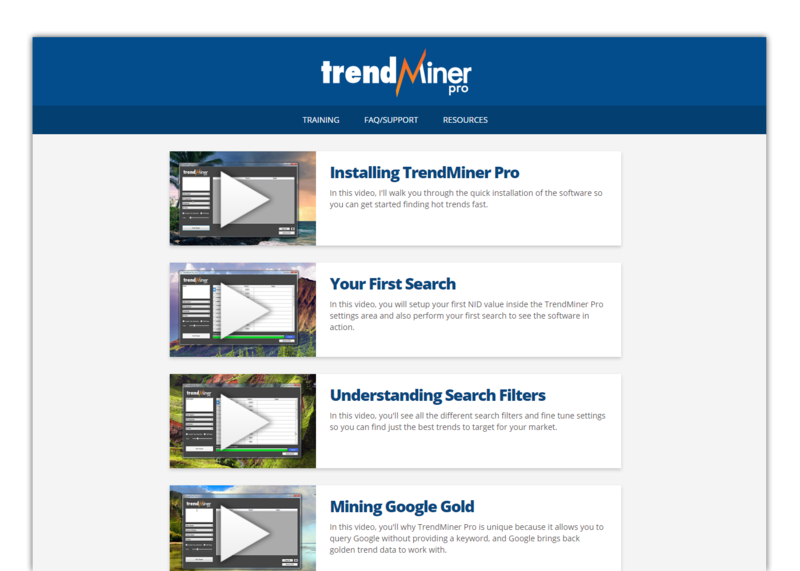 Watch these 3 step-by-step video case studies showing you just a few of the ways you can use TrendMiner Pro to get more traffic and sales and grow your business faster.. Inside the Members' Area, there are 16 different step-by-step training videos and case studies to help you get started quickly. Watch the HD video training anytime, from your computer or mobile device. Learn in a simple step-by-step fashion, as you watch over the shoulder to see exactly how everything works. 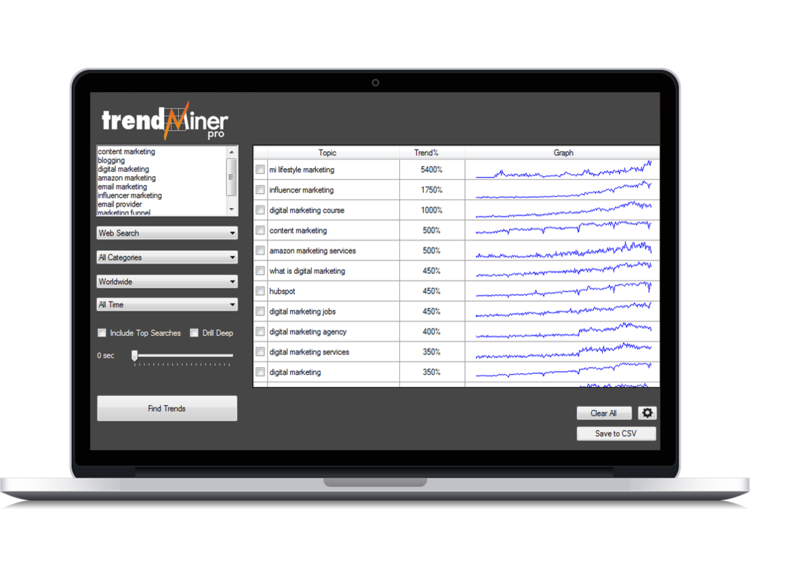 Learn about every feature of TrendMiner Pro and how to properly find hot trends. Study the case studies to see exactly how you can apply the trends to get traffic and sales and grow your business. In this video, I'll walk you through the quick installation of the software so you can get started finding hot trends fast. Within a few minutes the software is installed, and you will be finding your first trends. Over 17 Million Terabytes of data analyzed in seconds. HOT! Detailed trend graphs make it easy to spot the best trends (and avoid the markets that are in sharp decline). 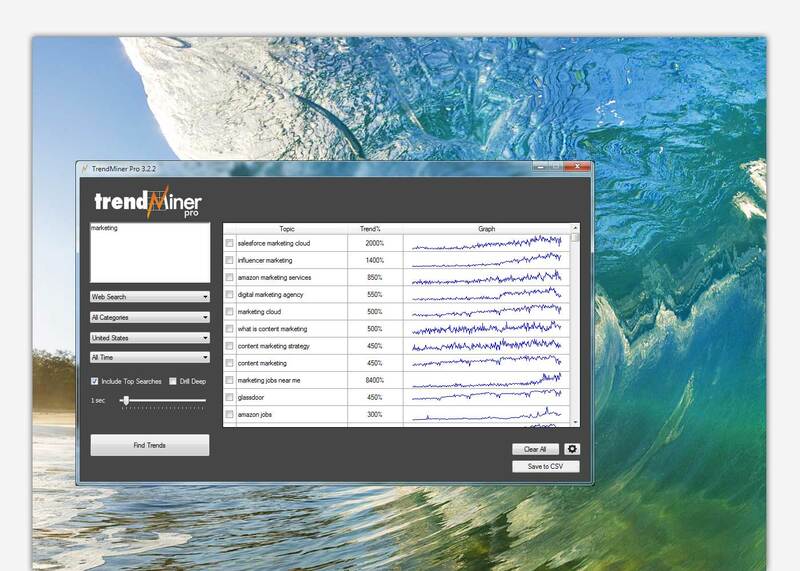 Get started quickly with TrendMiner Pro and perform your very first search. Within 90 seconds of installing the software, you'll already be spotting hot trends. Learn why trending keywords are different than trending topics...and how to use both to get more traffic. Examine the powerful category filters that allow you to grab data directly from Google, without submitting a keyword. Google reveals the hottest trends when you just ask them to give you all the trends for a topic, without providing a single keyword. In this video, you'll see all the different search filters and fine tune settings so you can find just the best trends to target for your market. See exactly how to analyze all the search trends occurring at Google for your market using the best keywords. Understand how trend matching works with your input keywords and how they affect the results and how you should target the trends you uncover. See real examples of trends that you can use for your content marketing. See the powerful concept of LSI trending terms. Learn the difference between trending topics and trending keywords, and how you can use both of them to get more traffic and sales. In this video, you'll why TrendMiner Pro is unique because it allows you to query Google without providing a keyword, and Google brings back golden trend data to work with. 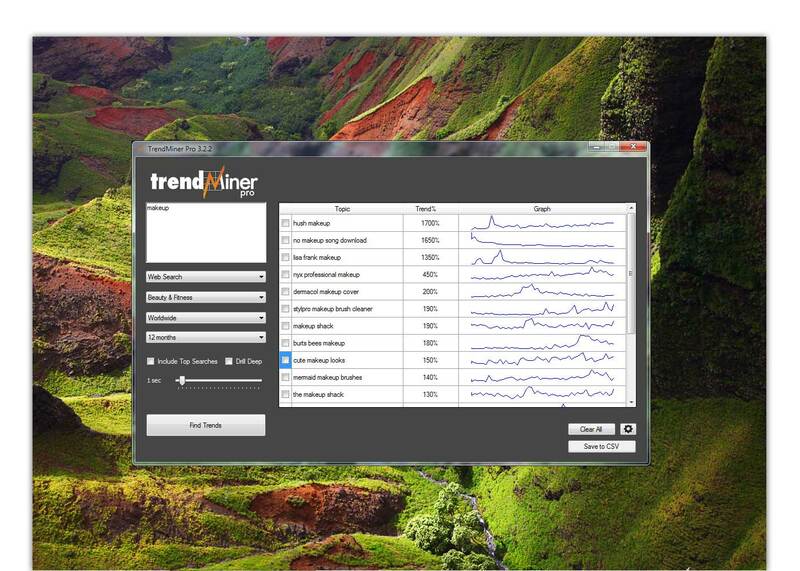 TrendMiner Pro is so powerful because it directly accesses Google search data so you can find trends instantly. You'll see how easy it is to have Google tell you what keyword trends matter, even if you don't know a thing about the market. In this training video, you'll see exactly how to analyze every single keyword within a geo market and find specific trends that matter. Instant graph requests will allow you to analyze the trends you get back even further, and instantly know if the trend is worth your time and effort. In this video, you'll see how to use the different Search Types, and what kind of profitable trends they can uncover. 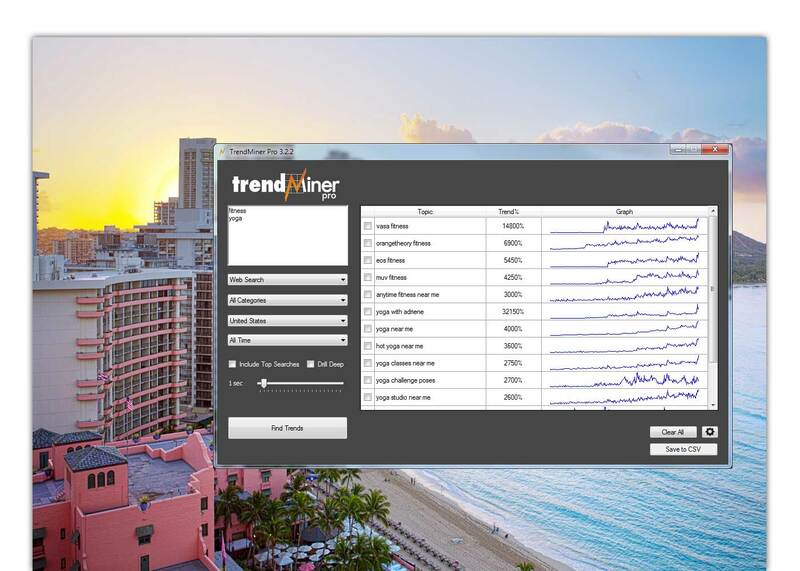 In this video, you'll explore the powerful feature of international trend mining and how to spot trends in foreign countries. Find hidden buyer trends in markets you aren't currently serving, but could be, to grow your business faster. In this video, you'll see exactly how and when to use the powerful category filters and controls and how they affect the data you get back. 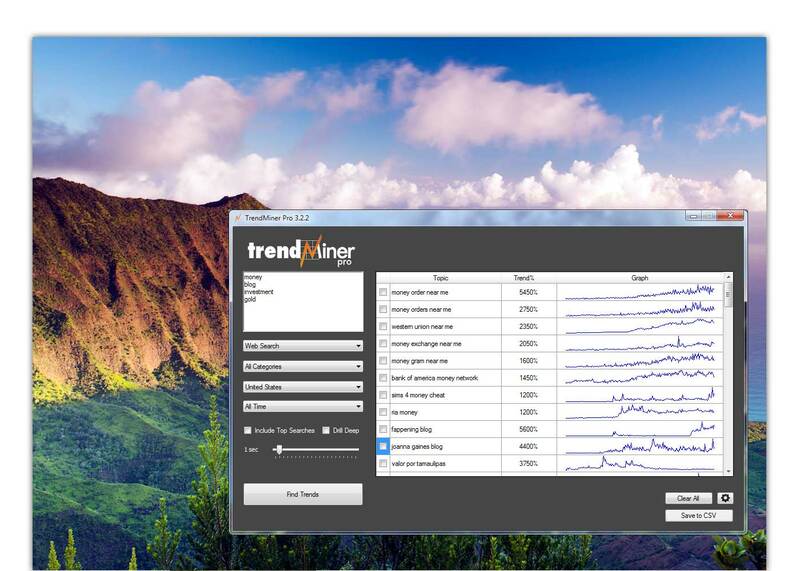 Whether you need to find 10 trends or 1,000 new trends, TrendMiner Pro can handle your request. Built in proxy feature included for anonymous queries. In this video, you'll see why it is critical that you understand how the data controls affect your trend results and how to pick just the right settings. 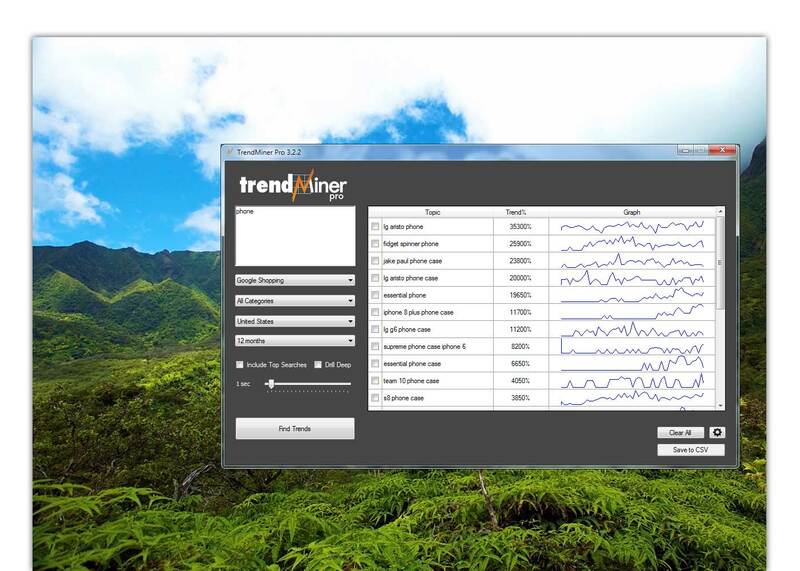 TrendMiner Pro is the only software that allows you to find trends within trends, and drill deep into any topic to uncover all the hidden trends. In this video, you'll see how to get even more trend data and specific trending topics by tapping into Google's own powerful top searches database. Learn what "Top Searches" are, and how to use them to drill directly into the most searched for data on Google. It's impossible to do this type of trend spotting without software. 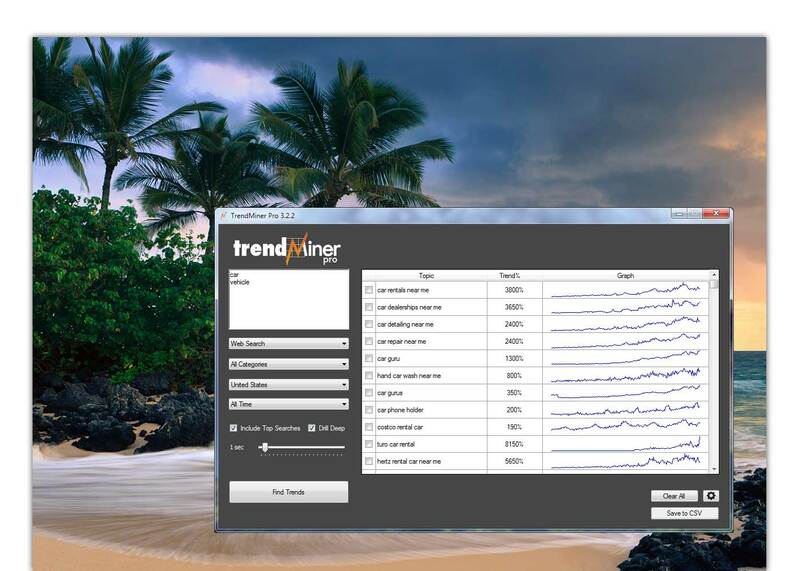 Learn to use TrendMiner Pro to crack your "trend code" in seconds. Google is just giving away this data. We might as well mine it for the next "Big Thing"...and get ahead of the competition. 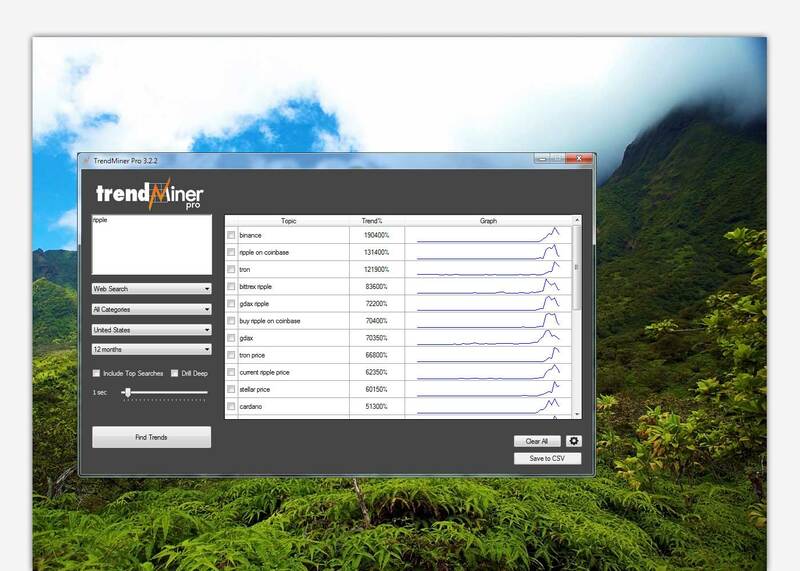 In this video, you'll discover to drill even deeper and find hidden trends that others cannot see without the advanced settings of TrendMiner Pro. In this video, you'll see how to go from top trend data to actual keywords driving those trends that you can target for traffic. 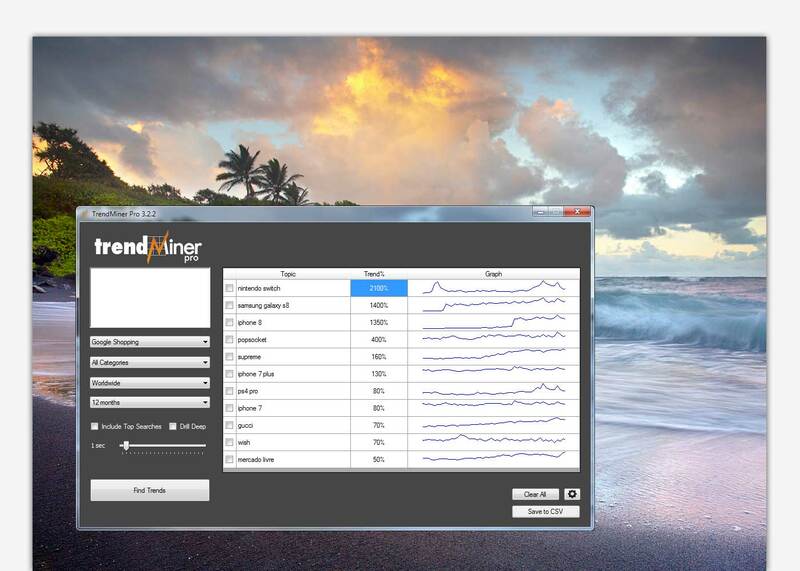 Real case studies you can follow so you get the most out of TrendMiner Pro from the very first time you use this powerful software. Use the power of 80/20 with top level trends, and get all the traffic from longtail keywords as well. In this video, you'll learn how to create your own seed topic lists to use anytime you want to uncover more traffic from trends in your market. In this video, you'll learn exactly how to find trends hidden deep within your categories and keywords. Find "Profitable Niche Trends" by crossing product trends with search trends. Use "early adopter search behavior" to reveal the products that the "masses" will be buying tomorrow. In this video, you'll see how to spot the longest running trends using the 12-90-30-7 Step Down Method. How to avoid ACCIDENTALLY missing trends by keeping a narrow focus. Know when "enough is enough" with your target date range...so you find the best trends in your market. In this video, you'll discover how to reveal hot international trends that can be inexpensive ways to drive traffic to your site with either free or paid traffic strategies. Find HOT trends and untapped markets with Geo Targeting. In this video, you'll learn how to narrow down even the biggest market categories to very specific, laser targeted trends that you can profit from by getting more buyers to your offers. Laser target huge markets down to extremely specific micro-trends and actual keywords. Analyze BILLIONS of keywords down to a specific hot trend in just a matter of seconds. See how easy it is to get Google to reveal incredible "micro-trends" after being given a single keyword that is searched for millions of times each month. Bought and watched on Wed night. Friday night at 11pm I started playing around with an old niche and saw two keyword trends that I wasn't using. Stayed up to 3am to create landing pages and added the KWs to my PPC campaign. By 9am, I'd made $150 profit on those KWs. Thanks mate! I found a term and wrote an article around it. Within 10 hours of posting my article on my blog, I started getting traffic. Now it's #2 out of 709,000 on a broad search on Google. People are searching for that term, yet no one else has written an article with the exact phrase that was found with the tool. Wow! The real beauty of all of this is that anyone wanting to take this offline to local advertising would OWN the market, whatever it was, pure and simple. Brilliant! The possibilities are only confined by imagination. This is true "Laser Marketing" I am reduced to one word: Thanks!! No. Everything you need to run the software and start finding trends is included in the purchase. There are no upsells, no long term contracts, no hidden maintenance fees. The software is frequently updated and those updates are free of charge to existing customers. We're certain that you'll be pleased with your purchase. If for some reason you have trouble getting the software installed or you aren't able to use the tool, just email the support desk anytime and we'll be glad to help. If you're not satisfied, you can request a refund anytime within 60 days of your initial purchase, and we'll issue you a prompt refund. Where is the Members' Area? 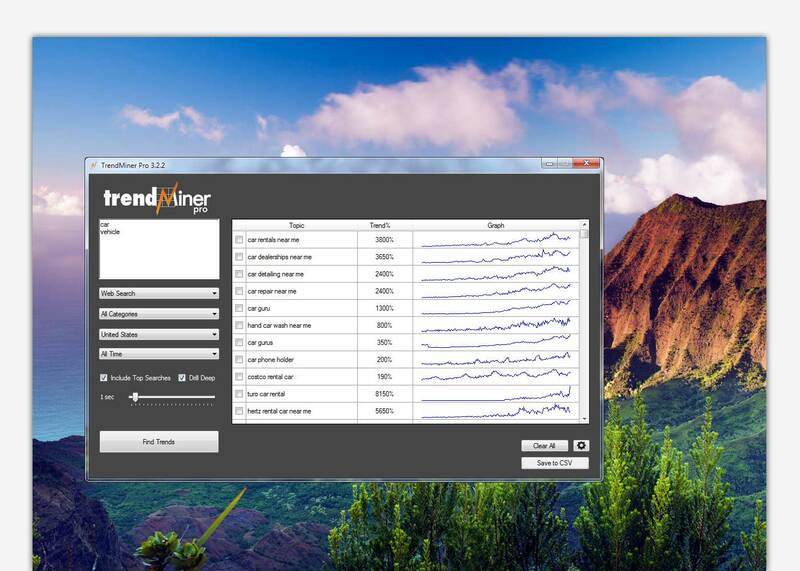 Click here to login to the Members' Area anytime, 24/7 to view the HD streaming videos for TrendMiner Pro. 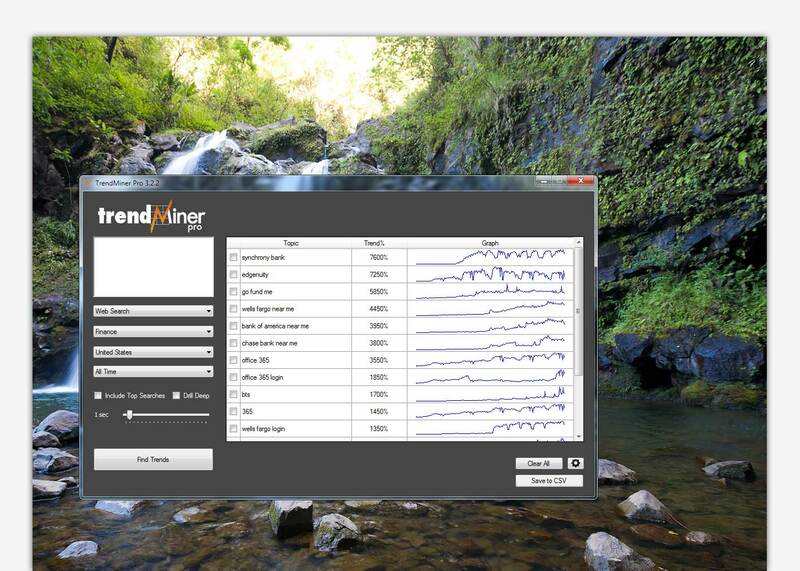 TrendMiner Pro is a Windows desktop application. It will work on Windows Vista, 7, 8, and 10. It doesn't require any more resources than any other typical Windows based software, and will even load on smaller netbooks. It does not require a fast CPU or lots of RAM. Will this work for _____ market? 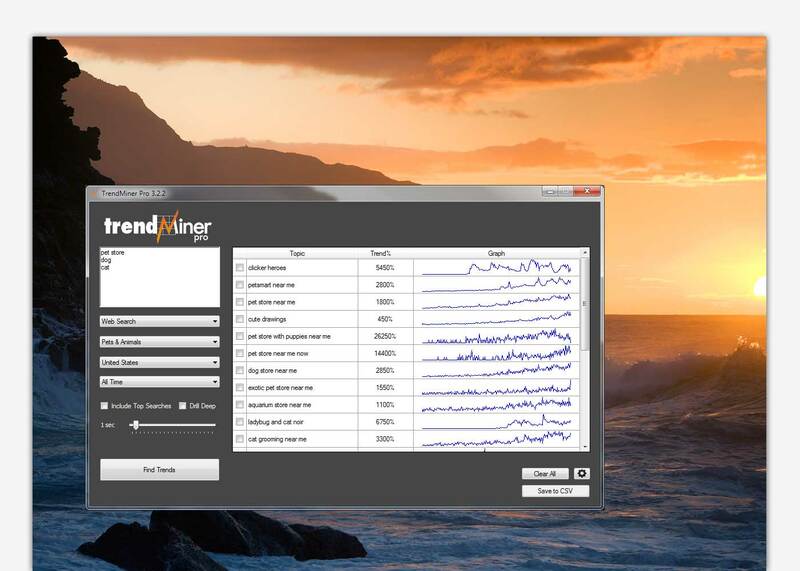 TrendMiner Pro will work for almost every market. There are some limitations due to how Google censors certain data. It will not work for sensitive categories like adult markets or in some cases gambling terms, due to how Google does not allow this data to be accessed. You're only limited by your imagination when it comes to trend spotting. You can use these hot trends to get traffic to your own websites, or sell the data to other markets in return for a free. Trending keywords can be used for marketing physical or digital products, as well as services. 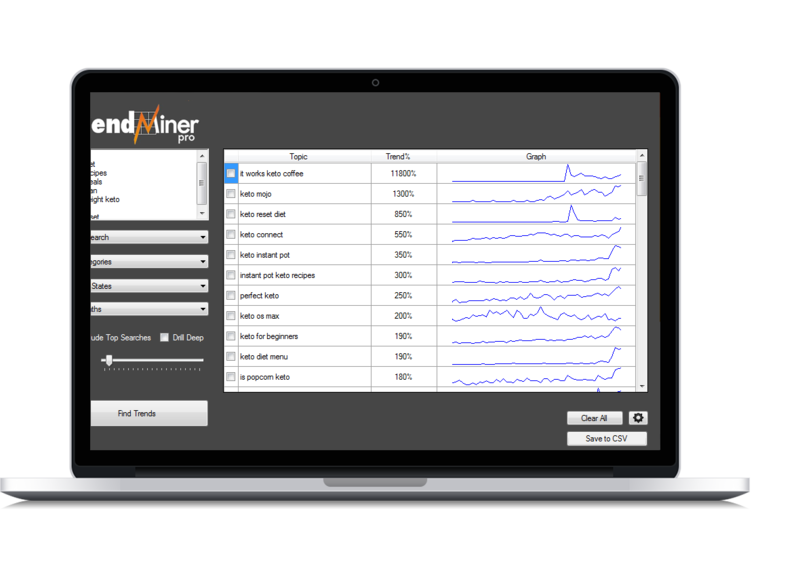 All data you find using TrendMiner Pro is yours to keep and use as you see fit.